At least one Meagher County commissioner may have a conflict of interest that could have affected his vote on a neighbor’s land deal. After indicating in a Dec. 4 meeting that they wouldn’t oppose the sale of the Holmstrom Sheep Creek Ranch to the U.S. Forest Service, Meagher County commissioners Herb Townsend, Rod Brewer and Ben Hurwitz reversed their decision in a Dec. 19 resolution. The owner of the Holmstrom Ranch wants to sell almost 4,300 acres to the Forest Service and doesn’t require commission approval for the sale. However, the Forest Service can’t close the deal right away. 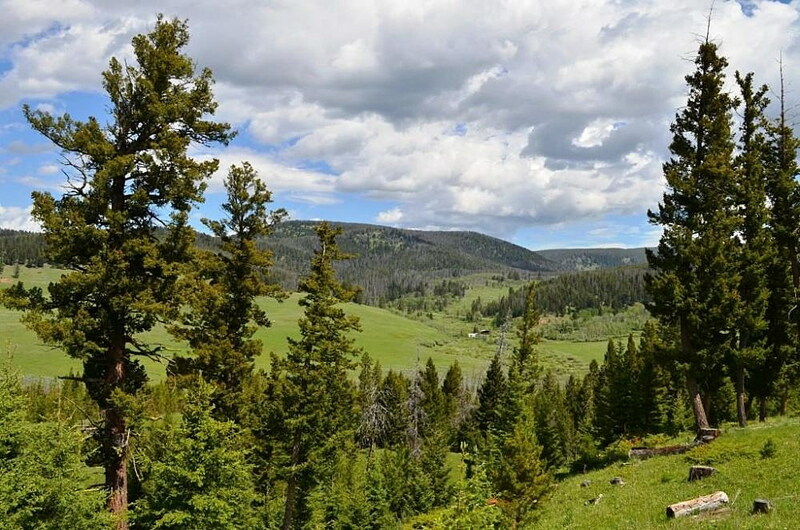 The Rocky Mountain Elk Foundation agreed to purchase and hold the land until funding is available, but only if there’s no opposition from the commission. The Dec. 19 resolution may cause the RMEF to pull out of the deal, but Brewer and possibly Hurwitz should probably not have weighed in due to conflicts of interest. It turns out that Brewer’s niece, Leanne, married into the Bodell family, which owns the Sweetwater Ranch, three sections of land that are interspersed among Forest Service and Holmstrom sections that surround Sheep Creek. Because the Forest Service sections are not accessible to the public, advocates of the sale hope to get more access to the creek and surrounding land for hunting and fishing. The ranch has cattle allotments on the nearby Forest Service land, but those allotments could change if the Forest Service acquired the Holmstrom property. The Bodells don’t support the sale. A day after the Dec. 4 meeting, Leanne Bodell posted to the “Into the Little Belts” Facebook page saying the commissioners hadn’t met to vote on the sale and any reports of their approval was false. Kyle Cunningham, formerly of Bozeman, challenged her, saying she should disclose her private interest in the Sweetwater Ranch before commenting. On Tuesday, Brewer denied knowing that the Bodell property was checkerboarded next to the Holmstrom sections. He reiterated that he didn’t want the Forest Service to own more than a third of the county, but he respected the owner’s right to sell. Montana’s Code of Ethics prohibits conflicts between public duty and private interests, saying board members cannot benefit personally or financially from their position. If there’s a question of a possible conflict, Montana law also requires board members to disclose the nature of any private interest that could create a conflict. Brewer said he would consider recusing himself from the decision, but wouldn’t go so far as to say he would recuse. Hurwitz may also have an interest to disclose regarding the sale. 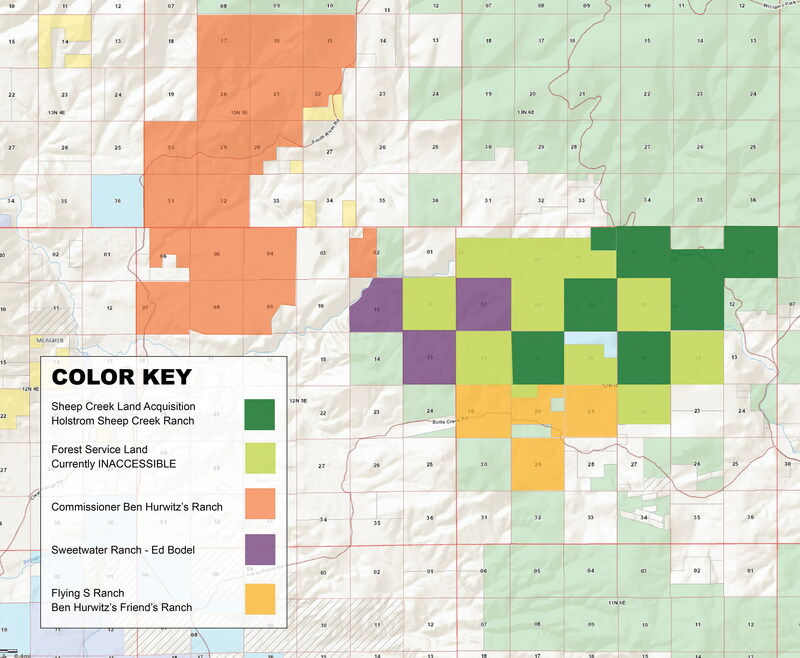 Hurwitz owns a nearby ranch and one half-section abuts the Sweetwater Ranch and includes a section of Sheep Creek. If the Holmstrom Ranch became public land, more fishermen might wade or float the creek through Hurwitz’s property. The sale of the Holmstrom Ranch would add 4,300 acres of public land and unlock 7,000 acres of previously inaccessible Forest Service land. Advocates of the sale, including those who testified at the Dec. 4 meeting, suspect that at least two commissioners don’t want the public to invade those areas. In a November meeting, the commission had said they wouldn’t support the sale, citing a loss of county tax revenue. At the Dec. 4 meeting, in front of about 50 people, White Sulfur Springs resident Jeremiah Ben Haugan and RMEF representative Mike Mueller presented arguments for approving the sale. Holmstrom Ranch owner Tom Davis asked if the commissioners would be mad if a board wouldn’t approve the sale of their property. Chairman Townsend said it was not his place to say yes or no, but he didn’t want Meagher County turned into elk habitat. “As a landowner, I don’t want anyone to tell me who I can or cannot sell my land to. That’s private property rights,” Hurwitz said. But when Mueller asked if the commission would say on the record that they would remain neutral on the sale, Brewer said the commission wasn’t ready to take a vote. Sportsmen’s groups that support the sale to the Forest Service include the Theodore Roosevelt Conservation Partnership, Backcountry Hunters and Anglers, Montana Wildlife Federation, Trout Unlimited and the Rocky Mountain Elk Foundation. Davis has the Holmstrom property on the market for $7.5 million. The RMEF had planned to have the property appraised this month. Calls to Mueller were not returned before press time.